Van Wade of Wade and Gatton Nursery of Ohio registered this sport of H. 'Gold Standard' in 1987 as part of the Richland Series of hostas. It is a large size (18 inches high) gold/yellow leaf version of the original cultivar. The leaves are ovate, slightly wavy and corrugated and it bears pale lavender flowers from mid-July into August. According to The Hostapedia by Mark Zilis (2009), "This was the first cultivar in the Richland Series and continues to be the most popular...It doesn't quite have the vigor of its mother plant, but still makes a great landscape plant." 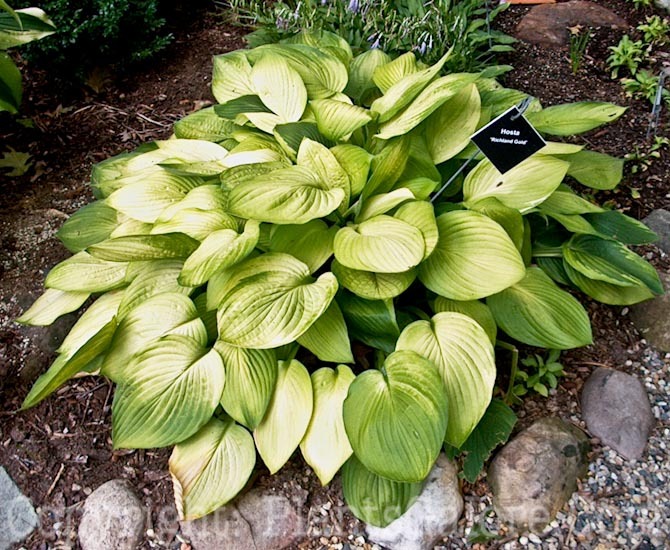 The New Encyclopedia of Hostas by Diana Grenfell (2009) states: "Leaves are late to emerge...Vigorous, a rapid increaser. Ideal at the edge of light woodland. Suitable for container growing."